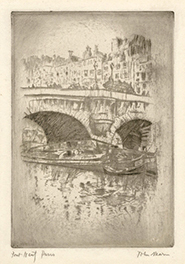 Pont Neuf, Paris = 1905, Etching. Zigrosser 11. Edition c. 25. Signed and titled in pencil. Signed and dated in the plate, lower left. Numbered A -2 in the bottom left margin. Scarce. Image size 7 7/8 x 5 7/16 inches (200 x 138 mm); sheet size 10 1/4 x 7 7/8 inches (260 x 200 mm). A fine, atmospheric impression, with selectively wiped plate tone, on cream wove Japan paper; the full sheet with margins (1 1/8 to 1 3/8 inches). Slight surface soiling in the margins, otherwise in excellent condition. Marin's first published print. Scarce. Collections: Cleveland Museum of Art; National Gallery of Art, Philadelphia Museum of Art. Brooklyn Bridge No. 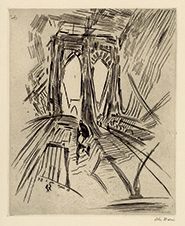 6 (Swaying) = 1913, Etching. Zigrosser 112. Edition c. 12 (Steiglitz); 1924, unknown but small (New Republic). Signed in pencil. Signed and dated 13 and B.B. 6 in the plate, lower left. Image size 10 5/8 X 8 3/4 inches (270 x 222 mm); sheet size 14 x 10 7/8 inches (356 x 276 mm). 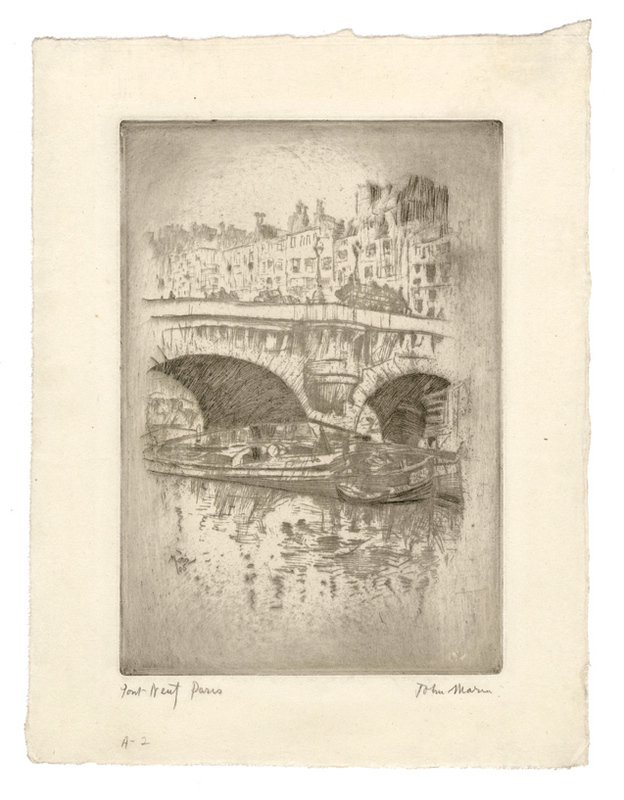 A superb, richly inked impression, with selectively wiped platetone; on warm cream wove paper, with full margins (1 to 1 5/8 inches), in excellent condition. Very scarce. Collections: Philadelphia Museum of Art, Metropolitan Museum of Art (Stieglitz Collection), Museum of Modern Art (Gift of Abby Aldrich Rockefeller). 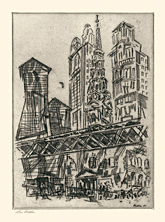 Downtown, The El = 1921, Etching. Zigrosser 134. Edition 30, plus c. 500 for the New Republic in 1924. Signed in pencil. Signed and dated in the plate, lower right. Image size 6 7/8 x 8 3/4 inches (175 x 222 mm); sheet size 10 7/8 x 13 3/4 inches (276 x 352 mm). A fine, rich impression, with selectively wiped platetone; on cream wove paper, with full margins (2 to 2 1/2 inches), in excellent condition. 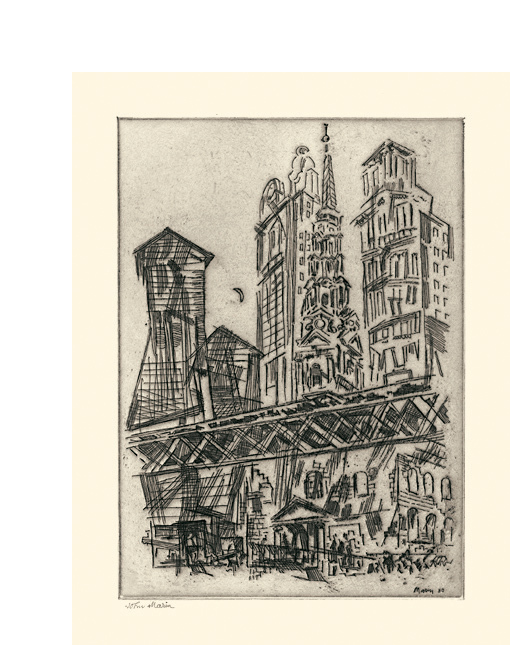 In 1924, this etching and five other originals by American printmakers were offered as a portfolio with a year's subscription to the New Republic. This impression from the New Republic portfolio. Illustrated in A Treasury of American Prints, Simon and Schuster, 1939; One Hundred Prints from 100 Artists of the Art Students League of New York, 1875-1975, Art Students League, New York,1975; A Century of American Printmaking: 1880-1980, James Watrous, University of Wisconson Press, 1984. Collections: BM (New Republic); DMFA (New Republic); DIA (New Republic); MMA (Steiglitz Collection); MoMA (Gift of Abby Aldrich Rockefeller); NYPL (New Republic); PMA (Master Set); University of Nebraska (New Republic); Princeton University (New Republic); Smith College (New Republic). 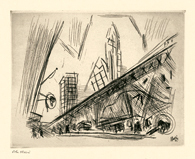 St. Paul's Against the El = 1930, Etching. Zigrosser 146. Edition c. 20. Signed in pencil. Signed and dated in the plate, lower right. Image size 6 7/8 x 8 5/8 inches (175 x 219 mm); sheet size 9 1/4 x 13 inches (235 x 330 mm). A superb impression, with burr and rich, atmospheric platetone; on greyish cream wove paper, with full margins (1 1/2 to 1 3/4 inches), in excellent condition. Scarce. Image size 4 1/2 x 6 inches (114 x 152 mm). Ex-collections: Marlborough Gallery; Kennedy Galleries, Inc.; Sid Deutsch Gallery; Cape Split Place, Inc.; and Owings-Dewey Fine Art; with exhibition labels for each gallery on the original backing board. 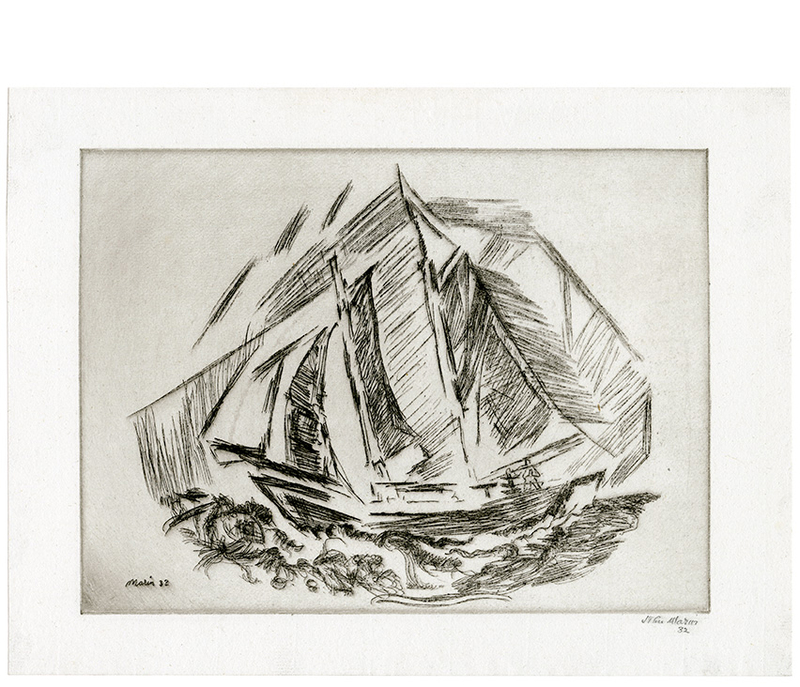 Exhibited: John Marin, 1870-1953, the Los Angeles County Museum of Art and Fine Arts Gallery of San Diego, November 28, 1970 - January 3, 1971. Zigrosser 155. 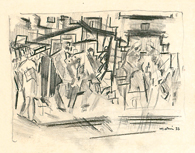 An impression from the first edition of 30. Signed and dated 32 in pencil; signed and dated Marin 32 in the plate, lower left. Image size 6 7/8 x 9 1/4 inches (175 x 235 mm); sheet size 8 3/4 x 11 9/16 inches (222 x 294 mm). A superb, richly inked impression, with burr in the heavily etched lines and delicate overall plate tone, on off-white laid paper; with margins (1 7/8 to 3 1/4 inches), in excellent condition. 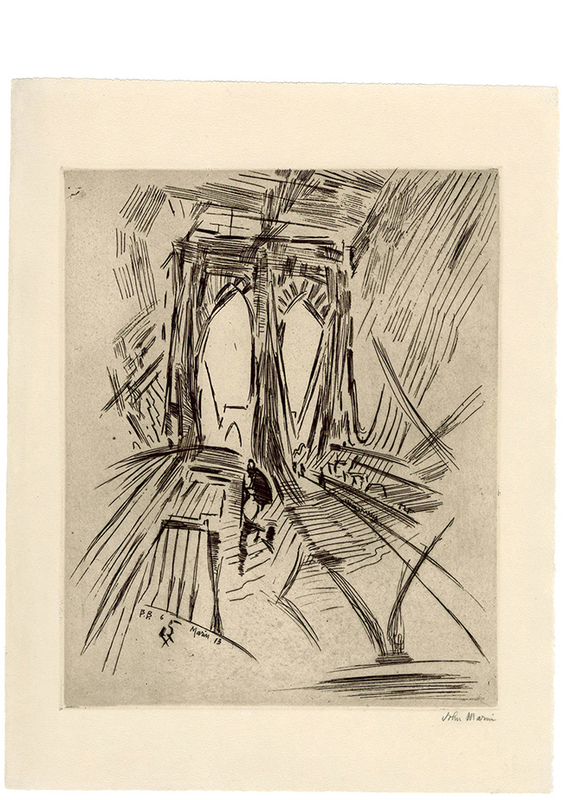 A scarce, early impression before the steel facing of the plate, prior to the American Artists Group unsigned edition of approximately 200. A personal favorite of Marin's, another impression of the print, signed and dedicated to Georgia O'Keefe, bears the artist's notation, "A Beaut." 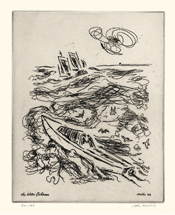 Cover illustration of the catalogue raisonné, The Complete Etchings of John Marin by Carl Zigrosser. Zigrosser pays special tribute to this work on page 19 of the catalog raisonné: "...the scene becomes alive by power of his creative imagination. The artist has stripped away all extraneous detail and set down, in the white heat of his intuition, only the very essence of things." 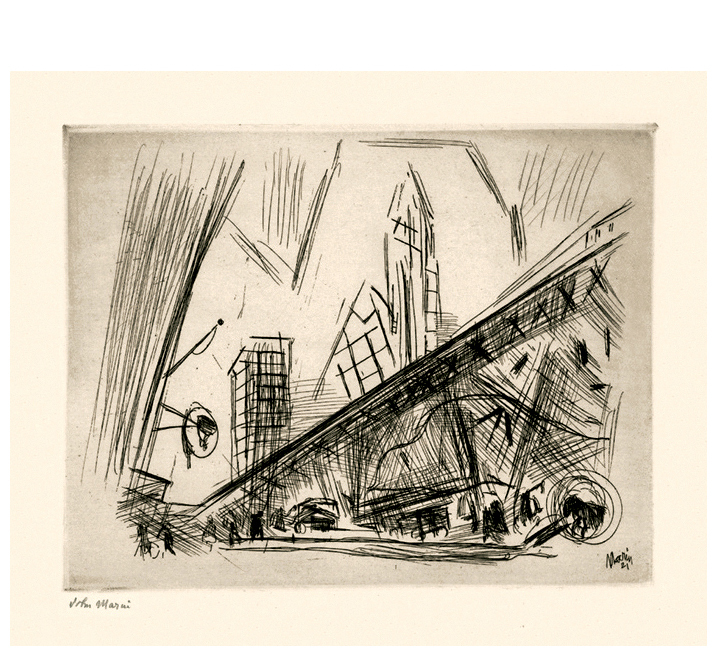 Reproduced: Zigrosser, Artist in America. Alred A. Knopf, 1942; Prints and Their Creators, A World History, Carl Zigrosser, Crown Publishers Inc., 1974. Collections: Art Institute of Chicago (gift of Georgia O’Keeffe); Addison Gallery, Andover (AAG); Baltimore Museum of Art (AAG); Metropolitan Museum of Art, (Steiglitz Collection); Philadelphia Musuem of Art (AAG); Smith College (AAG). 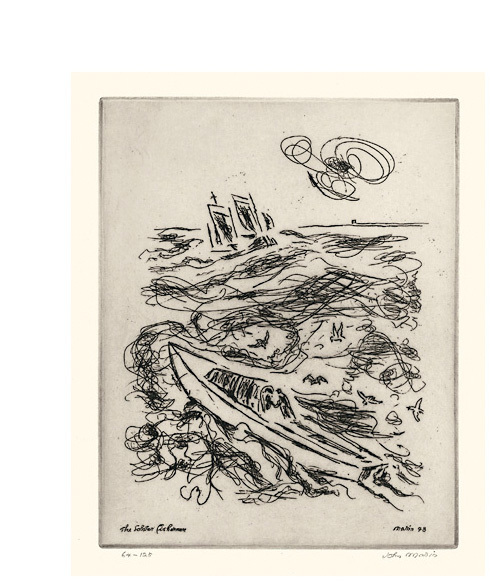 The Lobster Fisherman = 1938, Etching. Zigrosser 172. Edition 125. Signed and numbered 64/125 in pencil. Signed and annotated in the plate, lower right; titled, lower left. Image size 8 7/8 x 7 inches (225 x 178 mm); sheet size inches 12 5/8 x 9 1/4 inches (321 x 235 mm). A superb impression with rich burr and overall plate tone, on cream wove paper, with full margins (1 to 1 1/8 inches); in excellent condition. Printed by David Strang. 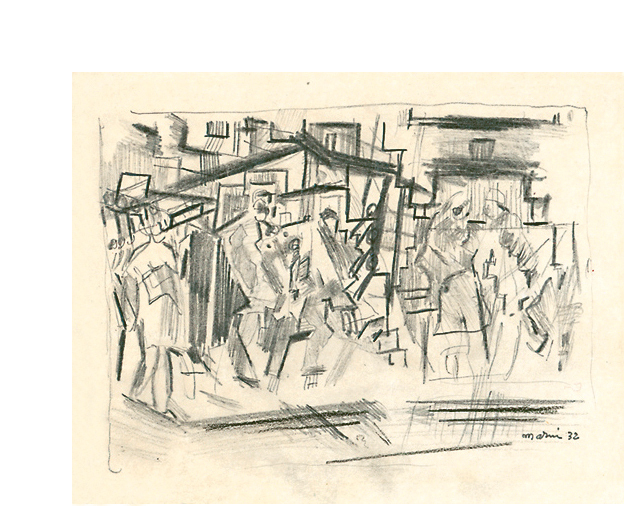 Included with the published portfolio of reproductions of Marin drawings by Twin Editions, 1950, in the original cloth-bound portfolio. Collections: Philadelphia Museum of Art.